What is a duffel bag? If you are asking yourself that question, the important thing to know is that a duffel bag can be extremely useful for travel because they are easy to access. You can grab what you need with minimal fuss, and they also hold a lot of stuff, meaning you don’t have to leave anything behind. Duffel bags are generally quite lightweight, which makes them ideal for carry on travel, and provided they fit into the overhead compartment they are great as carry on luggage too. We are going to guide you in the right direction when it comes to picking the best travel duffel bag, as well as showing you some cheap duffel bags to save you some cash. When you’re trying to find your ideal product, it’s important to pinpoint your needs, e.g. are you going into the great outdoors? Are you simply wanting a lightweight carry on option? If you want to fit a lot into a small space, check out the best rolling duffel bags on the market, but overall finding the best duffel bag for travel will stand you in good stead, no matter what your requirements. 2.2 Carry On or Check In? 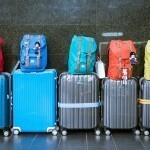 The capacity of a particular duffel bag is probably the most important aspect to look into when you are shopping around. Too small and you’re going to have to leave belongings behind, too big and your belongings will move all over the place, and clothes will become creased as a result. The best large duffel bag will be big enough to fit in everything you need for at least a long weekend, perhaps even a week away, and the average volume on the market currently is anything between 4000-7000 cubic inches. This is adequate space for anything you will need. 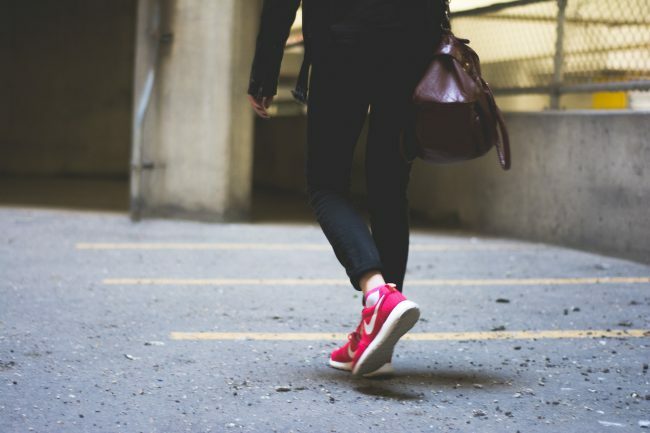 Of course, if you are going away for a shorter time and you don’t want to carry a large bag, it’s important to check out the best small duffel bag options. Whichever you go for, the major advantage is that because this is a fabric bag, you can maximize your space quite easily. Carry On or Check In? The best travel duffel bags luggage options are all usually the correct size, or smaller, to be allowed as carry on luggage with most airlines, however it’s always important to double check your particular product with your airline as some may be a little too large. The best duffel bag for air travel will easily fit into the overhead compartment, allowing you to cut down on the cost of booking in your luggage to the hold – we know this can save you a considerable amount on most airlines nowadays. Check out the best carry on duffel bags which have compartments inside if you are planning on doing this, to organize your belongings easier. 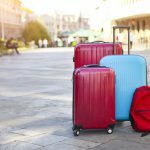 The best rolling duffel bag for international travel will usually have wheels, because if you are going away for a longer time, it makes sense that you will be taking more belongings, and therefore wheels cut down on how much you need to manually carry. There are many best travel duffel bag with wheels options on the market, so it’s really a case of shopping around. On the other hand, if you are only going away for a weekend, you probably don’t need wheels and you can simply carry the bag using the carry strap; in that case the best weekend duffel bags will simply be a small to medium size. The material of the bag really depends on the kind of holiday you’re going on. 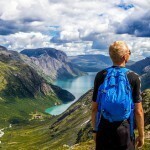 For example, if you’re heading out camping or hiking, then you will probably need to check out the best waterproof duffel bag on the market, to avoid your belongings becoming wet and soggy in unpredictable weather. If you are heading out camping or you’re going away for a longer time, then you want your bag to be more durable, and in that case the best leather duffel bag will work for you. There are many different materials on the market, including nylon too, so it’s really a case of identifying your needs and shopping around. Patagonia is a good name in the luggage world, and this particular product is one of the top rated duffel bags around. Holding an average 2746 cubic inches, this bag is ideal for a long weekend away, and is also one of the best rolling duffel bag for international travel options too. 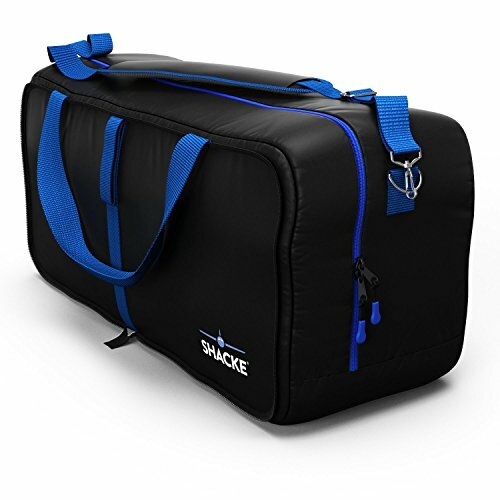 Available in black or grey, this is one of the top rated rolling duffel bags, and it has a strong telescopic handle which collapses down if you would rather carry the bag instead. This is easy as it is lightweight at 6.2lb. The handles seal together for easy carrying, and it is a very durable choice, making it one of the best rated rolling duffel bags around. In terms of compartments, there is one large compartment with a U shaped fastening, one external pocket, one zippered pocket at the side, and two mesh pockets which zip close also. The material is waterproof, made of polyester and laminate, with a DWR coating to keep water out. 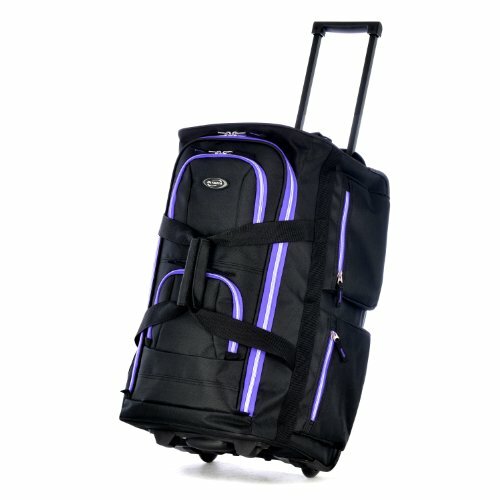 If you are looking for the best rolling duffel bags luggage option then this should certainly be on your short-list. Click here to see the latest prices and to read more reviews. This is another of the best wheeled duffel bag for international travel choices, and a durable option at that. Made of nylon and DuraLite Tech-Weave, you can be sure of a long-lasting bag in your luggage collection. This particular best duffel bag for air travel is actually three bags in one, as it can be used as a wheeled duffel bag that stands upright, a regular duffel bag, or a backpack. The handles seal together for ease of carrying, and the wheels are tough and durable, with a telescopic handle which can be hidden away. The main compartment is large and has front loading access, with an expandable section of 2” for anything extra you want to cram in. There is a zippered back panel also, which the backpack straps load into, and a front accessory pocket. 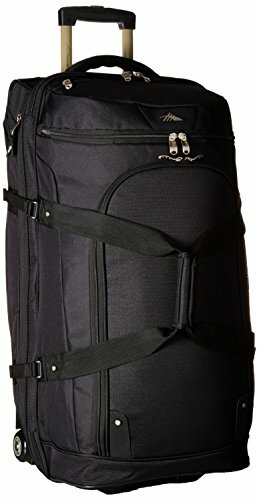 Overall this particular best wheeled duffel bag for travel has a capacity of a huge 7812 cubic inches, with strong zips for extra reinforcement and safety. 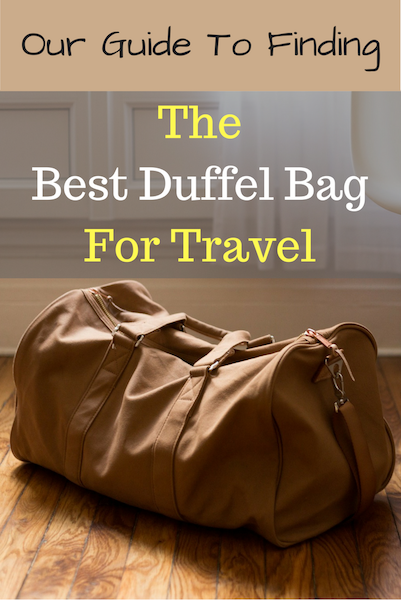 It is a standout of the cheap travel duffel bags around. You can read more information and reviews here. Big named brands always give you confidence, and this is one of the best men’s leather duffel bag options on the market. It certainly looks the part too, with tough black leather outer, you can choose from various other colors if you prefer. When you’re looking for the best leather duffel bags for men you need to tick a few boxes, and one is certainly spacious enough for everything you will need. There is a large main compartment and a side zippered pocket. There are adjustable shoulder straps which are ergonomically designed for comfort, so you can either carry it like a shoulder bag, or have it on your back, whichever is best for you. The side handles are padded for extra comfort, and the bag overall is water and weather resistant, to give you extra peace of mind that your belongings are safe. 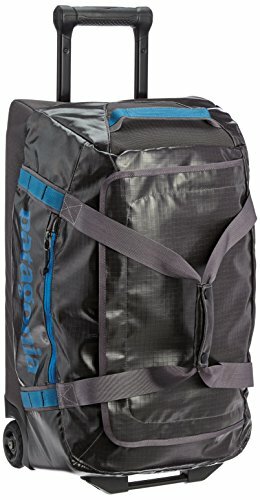 When looking for duffel bags cheap options, this particular model should be on your list again. Click here to see the latest prices and read more reviews. Olympia is another big name in the luggage world, and their duffel bags are certainly high quality. This particular model is one of the best travel duffel bag with wheels options you can go for, and it comes in many different colors for your fashion ideas. You can carry the bag or pull it along, thanks to the strong wheels and telescopic handle, and the carry handles seal together to make the bag easier to carry. The bag is made of polyester and textile inner, with strong zips to close – basically this is a strong option when looking for the best duffel bag with wheels. The top main compartment is U shaped to fasten, with plenty of room for everything you will need. There are also eight other smaller pockets, so you can organize all your belongings inside, making it one of the best duffel bags, as well as one of the best duffel bag brands. Our final option is another one of the best rated duffel bags on the market, and it comes in three different colors to choose from. If you’re looking for the best place to buy duffel bags such as this one then you almost certainly should head online to check out deals. This particular bag is possibly the best duffel bag for women who like to travel heavily but don’t want bulk, because you can fit a huge 70lb of weight inside! There is a large and strong zip which opens the bag all the way around, so you can easily grab whatever you need from inside, and the shoulder pads are made of memory foam, to add to the comfort side of things. There is also room on the main zip for a TSA lock, to keep everything safe and secure. There is an inner pouch inside the bag for your smaller items, making this the ideal bag for long weekends away or even a five day break. 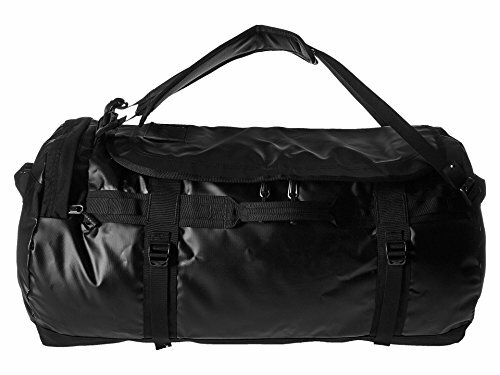 What’s your pick of the best duffel bags? 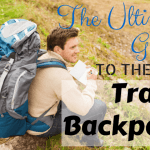 Looking for a backpack or suitcase instead? Read our guides to the best backpacks and best suitcases. I am a fan of duffel bags. In fact after using different type of travel luggage from backpacks to hard wheeled suitcases, in 2011 I tried out duffel bags and since then I have dropped all the rest. They are so practical and easy to pack and unpack. You can locate your struff within a minute. My favourite duffel bag is from Samsonite but your lists looks very interesting. I will check them out! Thanks for sharing! 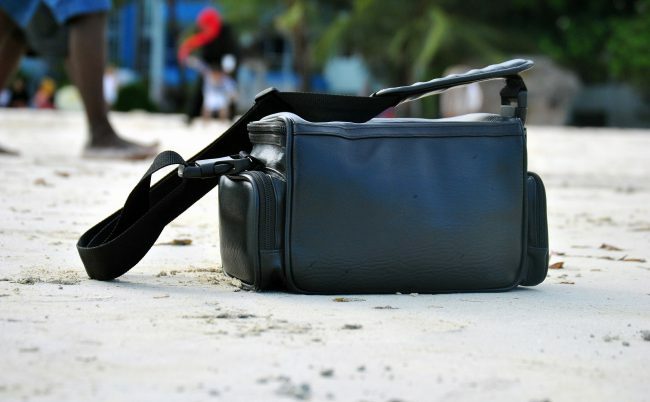 Really Indispensable post for bag lovers and travellers. I would like to mention here that always buy duffle bags that are made from premium quality leather as they are durable and long lasting. Whenever you buy the bags, One important thing to consider is about its spacious capacity and easy to access pockets.